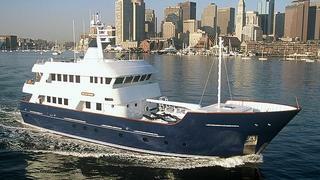 Chuck MacMahon at Northrop & Johnson sends word of a $405,000 price drop on the 31.1m motor yacht Newcastle Explorer. A rugged expedition yacht, she was built by Newcastle Marine in 2001 and accommodates eight guests in a full beam master suite, VIP stateroom and two twin cabins while two 400hp Caterpillar engines give her a cruising speed of 13 knots. Lying in Phuket, Thailand, Newcastle Explorer is down from $5.9 million to $5,495,000.